In shocking news during the Lent season, a representative from the Vatican released a statement to Red Sux Nation stating that recent history from the New England area in the United States has rendered it necessary for the Catholic Church to reconsider many of its views on planned parenthood, contraceptives and even abortion. After seeing this file photo a few years back, it is rumored that the Pope exclaimed, "What the (expletive) is that?" Worried that Hell didn't actually freeze over after the events of the 2004 and 2007 baseball seasons, the Vatican started a committee to investigate why. It was determined that this was a sign that the world would be coming to an end if they didn't take action. "Unfortunate bystanders were exposed to the species in this photo and it is possible that he may have infected other with Bandwagonitis." 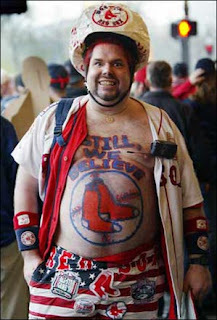 Outbreak was initially fast as previously normal people started trekking out to Walmart to buy Boston Red Sox apparel. "Red Sox hats just started to appear everywhere, we started to get scared. This new species also organized under a special terrorist organization called Red Sox Nation. They're not only a threat to national security, but the world as we know it." Recognizing the seriousness of the situation, the Vatican took a vote to allow abortions for anyone who has come into sexual contact with this species. The same vote also included the expedition any annulments for anyone whose spouse was the unfortunate victim of brainwashing Satan activists John Henry (file photo 2007) and Theo Epstein. They are ordering that all Boston-area parishes create donation funds to help Planned Parenthood of Boston, to cover abortions costs of unborn Bandwagon creatures, and to provide Special Education programs for Bandwagon fans that already exist. 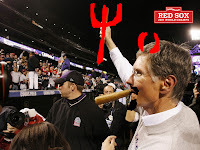 There is a papal decree that all Yankees fans must try their best to accept any Bandwagon fan that has been rehabilitated as one of their own. How can you do your part? Actively participate and show your pride in Red Sux Nation, encourage the union of all Boston Haters any chance you get and most importantly, support your team with pride and show Boston fans what it's like to have some class. It is also advisable to stay away from the rats at Fenway Park. Legal notice: if you're getting pissed off, lighten up and have some fun. Any hate mail you send can and probably will be used against you. Boston hate mail can be sent to interpreter@redsuxnation.com where we will have a recovering Bandwagon fan interpret your babble. Comments can be sent to BostonSucks@RedSuxNation.com, Catholic Church advocates or Vatican representatives can reach us at YouAreGoingToHell@RedSuxNation.com, please remember that even Jesus hates the Red Sox.